With its large and impressive design the 12′ x 8′ Shed-Plus Heavy Duty Shed Workshop is a structure that is going to make sure you have all the storage space you could ever need or be perfect as an area to get some work done. With its heavy duty design when you are inside here you are going to feel comfortable storing your prized items or even working on some fun DIY style projects. 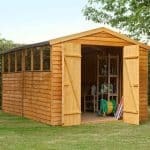 Incredibly while this is a shed that has been designed to be robust it also has a very attractive look to it, making it something that is going to be a highlight of your garden. 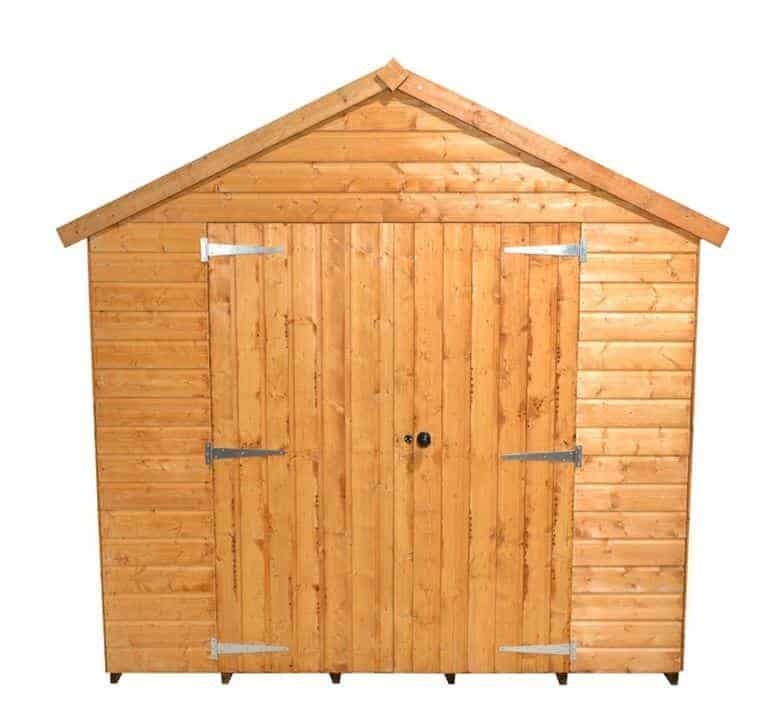 The reason that this is called a heavy duty shed is because of the high quality materials which have been used in its design. The walls are made with tight, tongue and groove shiplap cladding. The roof also is made in a tongue and groove style, making this one of the most waterproof sheds out there. Holding the whole shed together is a very thick frame that is going to keep it standing for a number of years. Under your feet there is some very thick floorboards which are supported with pressure treated floor joists which allow the floor to take a lot of weight and also help prevent rot. This large storage space is something which from that very first picture you can clearly tell it offers you plenty of space and a very strong looking design. 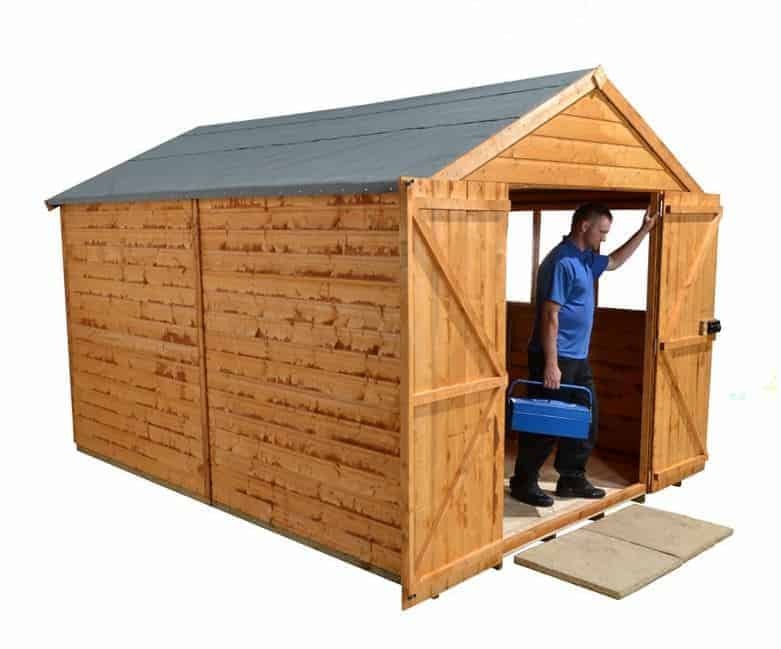 The 12′ x 8′ Shed-Plus Heavy Duty Shed Workshop is one of the larger sheds from Shed-Plus and the heavy duty design is going to make it really stand out well in your garden. 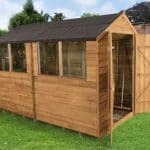 This is a shed which will require quite a bit of real estate in your garden so be sure to measure your garden properly before you order. Inside the shed the amount of room you have makes this something which can be used just as well as a workshop as it can for storage. The width inside is just under 12 feet and the depth 8 feet this gives you plenty of room to make use of. The height of the shed is something that impressed us a great deal. The ridge height is 8 feet 1 inch and we really love it when a long shed has a nice high section in the middle. Even the eaves height at 5 feet 9 inches is quite reasonable in our opinion. We love that long apex roof that is on top of this shed it is made with tongue and groove boards which are 10 mm thick. The tongue and groove nature of these boards mean that there is no way for water to get in and covering these we have some very impressively made felt which can stand up against the rain, snow and even meteorite sized hailstones. 12 mm tongue and groove shiplap cladding is making up the walls and we really could not be any more impressed. The way this so tightly locks together means that no matter how hard the rain hits this shed there is no way for it to get inside. Of course while this cladding is amazing from a practical point of view it is also very appealing to look at as well. Inside the shed and backing up that lovely cladding better than a high priced bodyguard backs up an obnoxious pop star, we have a heavy duty frame that is 45 mm x 45 mm. This is one very robust frame that is going to keep this a very sturdy structure for many years. The best kind of frames are the ones that are strong and just do their job without you really noticing them at all and that is what this one here does. The flooring of this shed is very interesting and something that we were very surprised to see. We expected the floor to be the same as the roof, but instead it is made from thick, 16 mm solid sheet boarding which is backed up with pressure treated floor joists to help protect the floor from rot. We are sure this flooring is going to feel very strong under your feet and allow you to store many heavy items inside here. All of the wood will be given a dip treatment which is going to look after the wood during transit and also while you are building it, but you will certainly need to coat the shed with a good, wood treatment once you have installed it. Once a year a fresh coating should be applied and if you do this, you will keep that lovely looking wood rot free. 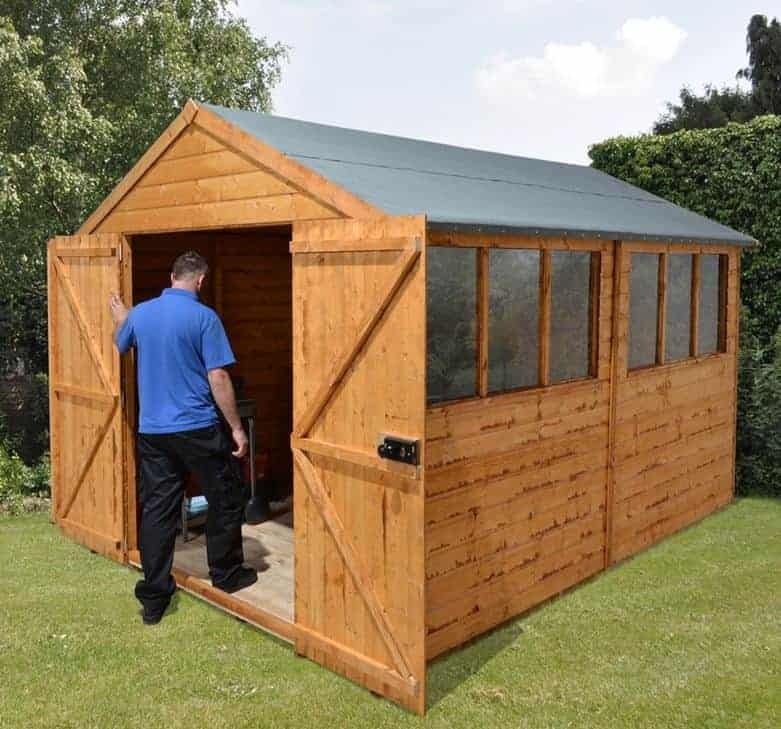 Coming with a ten year guarantee, you can clearly tell that, Shed-Plus have a lot of confidence in their, 12′ x 8′ Shed-Plus Heavy Duty Shed Workshop. Looking at those pictures, we are sure that huge double door is one of the first things that caught your eye. These are over 4 feet wide and an impressive, 5 feet 9 inches high. If you are going to be using this as a workshop then getting things as large as benches and shelving is going to be easy thanks to these doors. While the double doors offer plenty of space to get in and out they are also very well made and will stay in their place thanks to the high quality hinges which have been used. With six windows along one side of the shed, we are having a hard time thinking of another shed from Shed-Plus that lets in this kind of natural light. These are good sized windows that are made from styrene. We will admit that we would have preferred to have seen actual glass here, but at the end of the day, styrene does help keep the costs down so it does have its benefits. Those epic double doors may make it easy for you to get in and out, but thanks to the lock they come with, it is going to be hard for other people to do so. This is one very secure structure and we are sure you will have no worries storing your belongings inside of here. if you did want to add a little more security then adding something like a pad bolt with a padlock would be very easy. Of course any shed with six windows is not going to be offering much privacy, but if you do have nosey neighbours then you will want to make things a little more private. We suggest adding a set of blinds, curtains or even just a piece of fabric and then you will have some privacy. To give the shed a little bit more life, personality or even just make it go with the other things you have in your garden. You will want to give it a coating of coloured wood treatment. It is kind of amazing the vast amount of colours that are out there so have a look around and we are sure you will find that perfect colour. Incredibly there are no hidden extras with this shed at all. The price you see is all you need to pay as you get all you could possibly need with the shed. At the most the only thing you really need to think about adding is something to cover the windows. 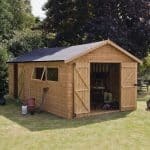 Shed-Plus are known for making high quality sheds and we feel that they have done a good job with this shed. Treatment is required and a little looking after is also, but if you do then you will have a shed which lasts for 20 or more years. This really is one very large shed and no matter what you need this space for, we are sure you will find this is more than enough space. It is not just the floor space either, we must remind you that there is plenty of headroom in here as well so you could even store things pretty high. 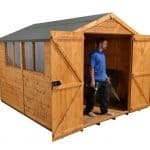 All large sized sheds can be a bit on the tricky side and certainly require two people. But as long as you do what the instructions tell you, look at the pictures and do not rush then you will have this built in around 3-5 hours. 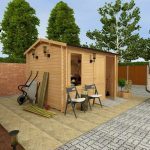 We know an 8.5 may seem high for a shed which is a penny under £800, but when you consider the huge size of this structure, the materials used and also the fact that you do not need to buy any extras at all. Then this does actually offer you very good value for money. 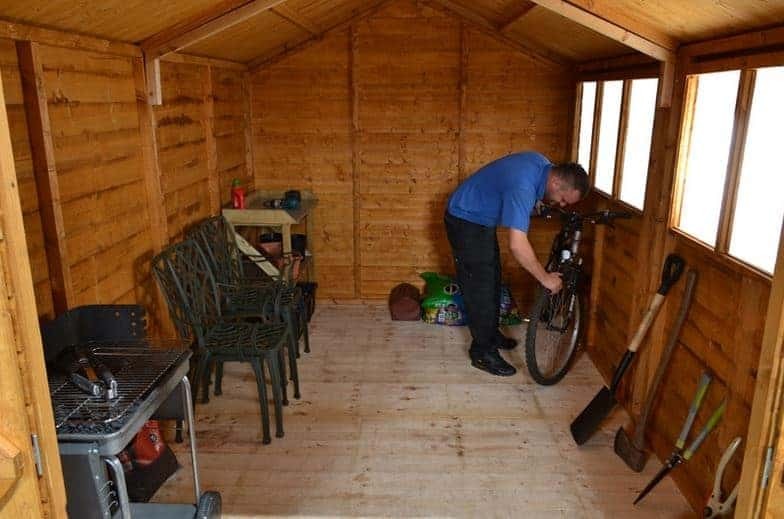 Final Thoughts: If a large amount of space to get some DIY work done, arts and crafts or even just as an area to keep the garden lawn free of clutter and the bikes out of the rain is what you are looking for, then the 12' x 8' Shed-Plus Heavy Duty Shed Workshop is going to be something that you really like. The size of this is just so impressive, we are sure that when you first stand inside it, you are going to be just amazed at how much room you have. We also really like the design of this, and despite being called heavy duty it still does have a very pleasant look to it. 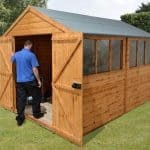 We feel that for the money you really are getting a great, large shed here and think this should certainly be something you think about adding to your garden.